The arepa de huevo is a corn flour arepa (disc shaped) filled with an egg and if you like with other proteins like meat, pork or chicken. It is quintessential to Cartagena, if you come to this wonderful place on earth you will be magically delighted with the arepa de huevo. 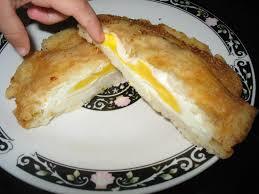 Make way egg macmuffin, after you have the arepa de huevo you maybe would like to take the recipe back home.